Nineteen. Including today, that's how many more days of school we have until summer break. NINETEEN!!!!! According to the comments, most people are out of school by the end of May or at least the first week of June. We, on the other hand, will be going until the end of eternity. At least that's how it feels. As you can probably tell, the last day of school simply cannot get here fast enough for me! This year has been a tough one. It's not because of any one, overwhelming reason, but a multitude of smaller frustrations. My youngest has had ongoing issues with a class bully this year. My middle one constantly complains about how annoying some of her classmates are. My oldest has had a great year, but in the midst of it has had to adjust to three different Language Arts teachers. I've "had it up to here" with testing and assessments that are ridiculously unnecessary. This was the first time that I worked at my part time job during the entire school year and it is still up in the air as to how long that will continue. I've not been my best self for the last several months either - feeling fatigued, gaining weight unexplainably, and not getting any answers from doctors and blood tests. We've made some big decisions this year about my job as well as our girls' schooling for next year and beyond. Add to all that piano lessons, riding lessons, soccer, holidays, talent shows, church events, and the list goes on. Top it all off with the spice of every day life like laundry, meals, dishes, and cleaning. It's been a lot. Maybe no more than what would be considered "typical" for a modern family of five, but it has felt heavier than usual. I am tired. Actually, I am exhausted and more than ready summer vacation to begin. So, what are the things I am most looking forward to once school ends? Well, it's funny you should ask! No more packing lunches! Three kids with different tastes and different menu preferences means packing three different lunches every single day. Once summer comes, they can fix their own mac and cheese or grilled cheese sandwich. No more 5:30 wake ups! Yep, that's when my alarm goes off every morning Monday-Friday. There are some people who thrive in the morning - I'm not one of them. At this point, even 7:00am sounds heavenly. No more book bags, papers, and pencils everywhere! Once school is out, the book bags can go in the closet and I won't be bombarded by papers every Monday. No more juggling schedules! I can't even tell you how many times I've said "I don't/didn't have time for . . . " in the last few months. Once summer gets here, there will be more time for all the things that need to be done. Truthfully, there will still be some juggling of schedules occasionally, but it will be much easier and less frequent for sure! Maybe, just maybe, I'll actually have time to write. One of those things I haven't had sufficient time for is my writing. There are lots of sites I want to submit to and, hopefully, I won't be forced to crank out mediocre blogs posts (like this one) at 9:00pm the night before they are due. Better yet, maybe I'll have time to read some of my favorite blogs, too! Nineteen more days. Then, I can breathe a sigh of relief and it cannot get here fast enough for me! Do you have school age kids? When is their last day of school? This post was part of the One Word Blog Linkup hosted by, Janine of Confessions of a Mommyholic, Marica of Blogitudes, and me! This week, the word prompt choices were Voices and Fast. If you would like to join the linkup you can find more information HERE, sign up for weekly emails HERE, and/or join our Facebook group HERE. Every Friday, two prompts are emailed. Choose one and write a post using that word as inspiration. Linkup up any time between 6:00am EST on Wednesday-9:00pm EST on Thursdays on any of the host sites. 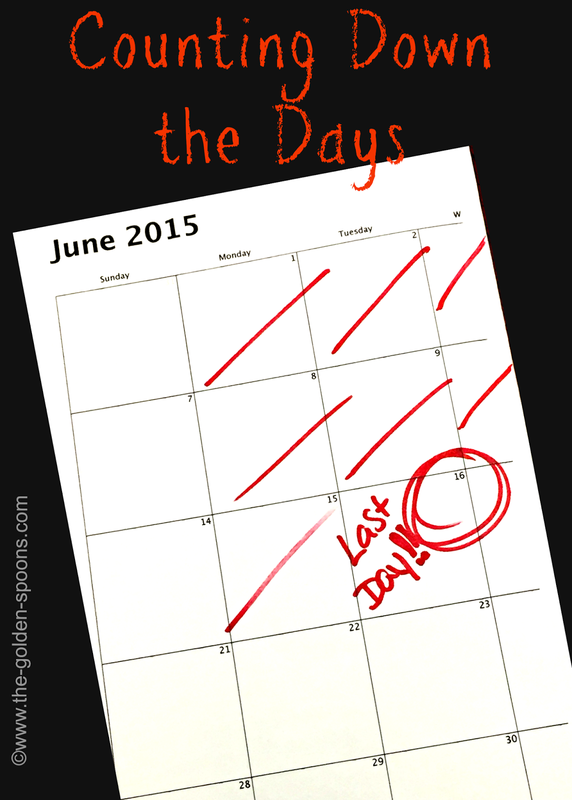 I haven't decided on a "last" day, since we homeschool. I'm actually leaning towards some school even during the summer, though not every day, just to keep our son caught up - he's never been part of the American school system, since we were stationed in Germany. Hang in there and I hope you take a fabulous vacation to celebrate! Ours is June 24th! Crazy, huh?? We still have over a month but I am SO ready. Last night we got home so late from a dinner and I said, "Wouldn't it be nice to just sleep in tomorrow?" But Scarlet had a big assembly today so we had to go. Lisa, our last day is June 19th. Ugh! We are all ready for school to be over. I'm looking forward to vacation, sleeping in, no homework...pretty much the same things my kids are looking forward to! Thanks so much! We have a family trip to the beach the week after school is (FINALLY) out! June 19 is awful. I guess that, since my kids are older, they are a little more self sufficient and they actually sleep late most of the time in the summer. I can get up at 7:00 and still be up before them! Wow! June 24th?? That is the latests I've heard yet! UGH I want to SLEEP!!! We've got one week left. I, too, am looking forward to summer, even though I'll still be working full time. At least I won't have to worry about homework or ballet and soccer for a while!! I will still be working part time, too and don't look forward to juggling that, but it will be easier without all the other stuff going on!